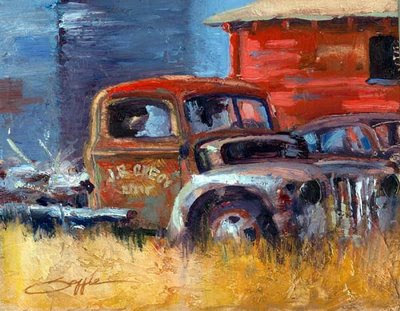 Randy Saffle - In the Field: Plein Air Painting Adventures: Rusty Truck 8" x 10"
I have been trying out a different painting surface lately. I use 1/4" thick Birch board that I cut to size. I apply a layer of gesso. After that is dried I add a layer of thick modeling paste with a wide brush, intentionally leaving the brush marks and texture. Then I finish the board off with a final layer of gesso. I started out in oils taking a few classes with a French painter that utilized a palette knife instead of a brush. I fell in love with the thick, juicy paint. I have painted several paintings using his same techniques but felt more of my drawing skills would show up using a brush. I'm hoping this new board technique will give my brushwork the thick textured appearance of using the palette knife. Click the photo above for an enlarged view. The textured board is very evident in the bottom golden field.